Click on map to increase size. 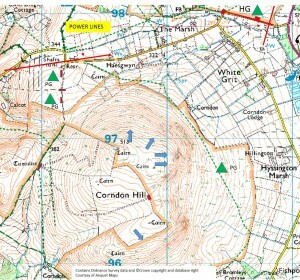 Note the farm indicated with the red oval and cross, in the photograph on the right. 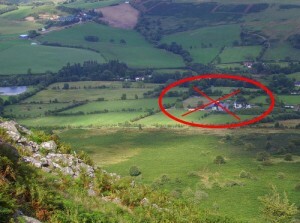 DO NOT overfly this farm or the surrounding fields. It is used to breed highly expensive, very nervous, race horses, which are apparently easily scared by things flying above. Causing damage to one of these horses would be very expensive indeed. Turn off the A488 at a derelict tower signposted White Grit/Priest Weston 2 km to a T junction. Take the rough track to the left. After 100m go through a gate which must be closed after passing. Go approx 1 km to a gate on the left at the far edge of a tree plantation. Go through the gate which must also be closed, approx 1 km to another gate where parking is to either side. Do not obstruct it. Note that the first 100 metres of this track is liable to be very muddy in winter and may not be passable except to FWD vehicles. IMPORTANT: we need to minimise the numbers of vehicles driving up. Hence only current LMSC members are allowed to drive up to the top (third) gate. All other pilots must park before the second gate. Even LMSC members should try to arrange to meet at the bottom, and share cars. 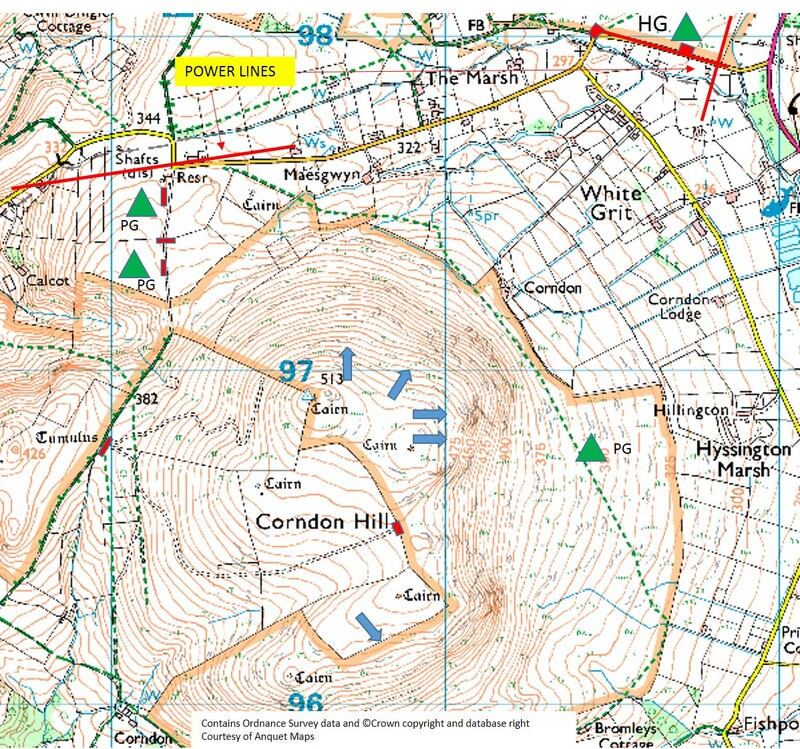 Take-off is either from the saddle directly in front of the parking area (easterly only) or from the peak in N or NE. Note that Corndon also has a small SE face. The SE take off is going right along the path by the top gate. Please use the stile where there is no barbed wire to lift your glider across. Top landing is easy on the peak but beware of rotor behind the cairn. Landing in the parking field is possible but subject to strong wind gradient and some rotor in certain directions. Take advice beforehand. Hang gliders: bottom landing is in the big, flat field to the NE (alongside the access road) BUT approach is over power lines (which have claimed victims) after a long glide, often into wind and alternatives are for skilled pilots only! The only access is via a gate at the western end. From the SE face there is no official bottom landing. Top landing is easy behind the barbed wire. Paragliders: In northerly wind it is possible to land in the fields on the right side after the first gate on the track up. You can also land in the field on the left but this is smaller and trickier. In an east wind, it is preferable to slope land (although watch out for lots of rocks strewn along the slope), or land in the large brown scrub area immediately under the hill. Do NOT walk out through the farm or ask a friend to collect you. You must walk back up the front of the hill. In south-east wind there is no official bottom landing. You must top land or slope land at the foot of the hill and walk back up. This is available to view online, or to download to mobile devices. Use it to complement the information provided in text format on this page. PLEASE NOTE: since this was recorded, the club has increased the required minimum hours to CP + 25. The hours given in the recording are therefore incorrect. The multimedia guide is older than this page, so do use both. Kai Coleman, 10.09.2009, 137.5km to Tenby. PG. For hang gliders, a confirmed distance is Ken Wilkinson, 122km to Bristol, in 1985. Possibly others may have gone further, including Judy Leden who may have done around 130km to Barry. Conditions at this site can change rapidly as small wind strength and direction changes have a profound effect on the air currents around the roughly dome shaped hill. Unless you are very experienced in flying this site over a number of years then please make sure that you receive a site brief from a suitably experienced pilot – on the site at the actual time of flying. Use the list of coaches who are detailed on the website to arrange this. This area is used by low flying military aircraft on weekdays. The nearest airspace is Welshpool ATZ, which might be a problem from the SE face. There is also a large danger area south of Builth.